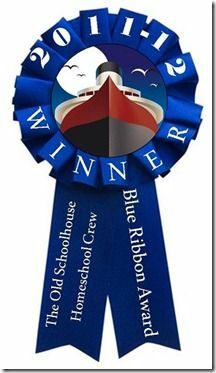 Under the Sky: Blue Ribbon Best of the Crew! Blue Ribbon Best of the Crew! As the 2011-2012 Crew year comes to a close, the TOS Homeschool Crew present awards to our vendors that make the Crew Favorite list. We vote towards those we felt had the most impact in our families and the ones with the most votes receive a TOS Homeschool Crew Blue Ribbon. The following vendors are the recipients of the award this year. Click on their name to check out the Crew reviews! If I reviewed it, I shared the link there too. Congratulations to our winning vendors! We hope you will sail with us again! HUGE Homeschool Crew Blog Hop! 25% Off Great Books in May? Oh yes!